IBS Investment Bank offers institutional investors a distinctive array of qualified investment opportunities through its origination arm Institutional Banking Services, N.A. CORP (IBS, N.A.). IBS, N.A. offers unique expertise in the underwriting and origination debt/equity financing for borrowers located on the North, South and Central American Continents. Below are select transactions that reflect IBS N.A. 's capabilities. Please contact a Relationship Manager for trasaction specific quesitons. For nationally covered release click National Press. IBS Investment Bank a division of Institutional Banking Services N.A. CORP IBS, N.A. 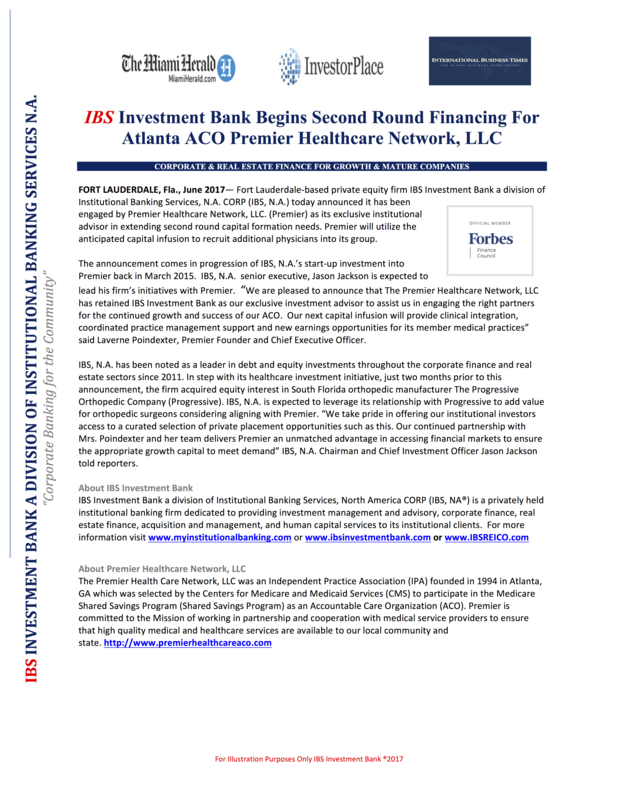 Exits 3 Key Investments and Positions to Re- Investment Additional $400MM Throughout Eastern U.S.
IBS Investment Bank a division of Institutional Banking Services, N.A.CORP Provides Expansion Capital for Advanced Case Parts, INC.
IBS Investment Bank a division of Institutional Banking Services N.A. 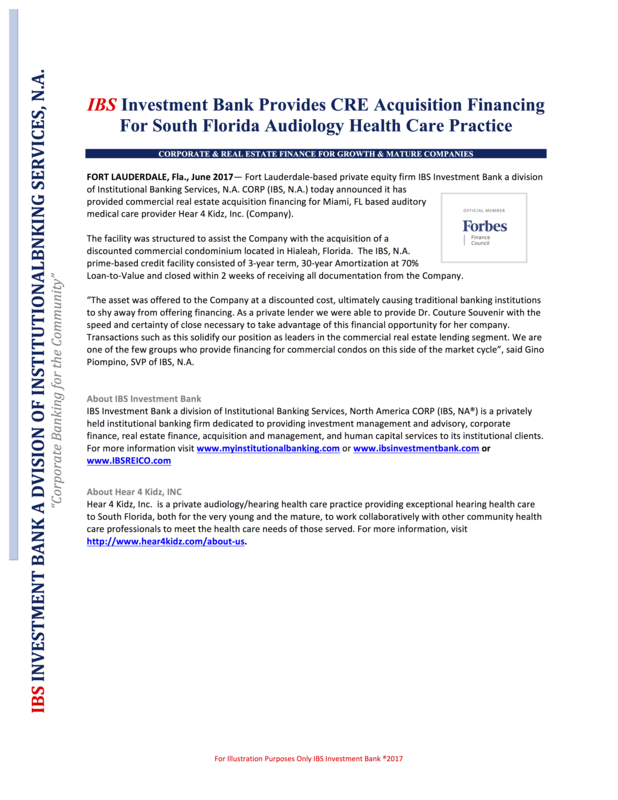 CORP Provides Acquisition Financing for $1MM Retail Center in Sunrise, FL. IBS Investment Bank is a division of Institutional Banking Services N.A. 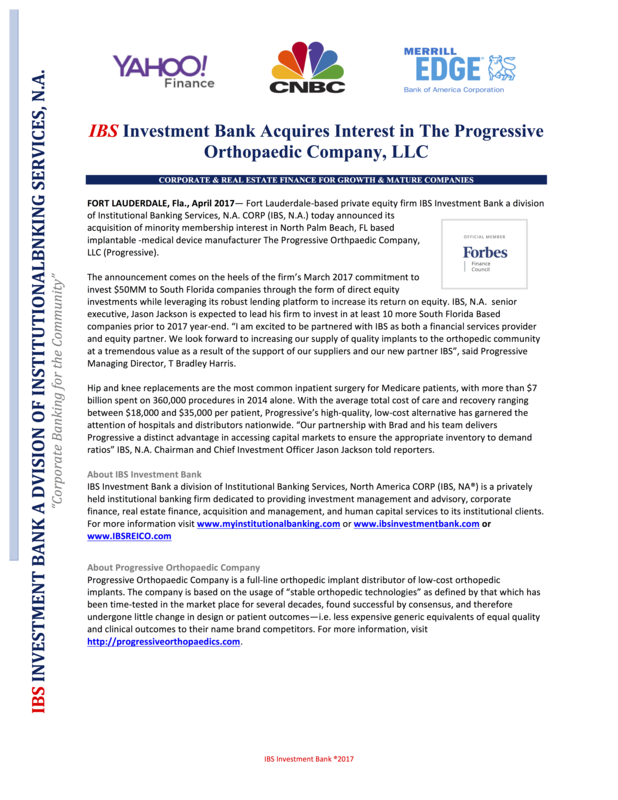 CORP provides $1MM expansion loan to Proven Natural Products, LLC . IBS Investment Bank is a division of Institutional Banking Services N.A. 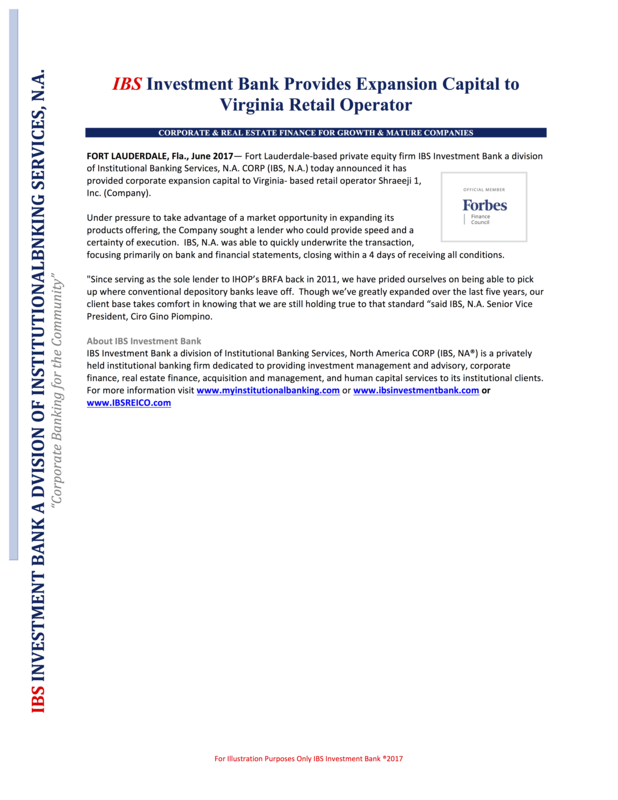 CORP serves as an investment real estate referral source to depository banks. IBS Investment Bank is a division of Institutional Banking Services N.A. CORP expands its lending capacity to better serve it clients. IBS Investment Bank is a division of Institutional Banking Services N.A. CORP issues Standby Letters of Credit. IBS Investment Bank is a division of Institutional Banking Services N.A. CORP serves as a leader in small to medium sized real estate and corporate financing. IBS Investment Bank is a division of Institutional Banking Services N.A. CORP provides expansion loan to Bostonian Hospitality Group . IBS Investment Bank is a division of Institutional Banking Services N.A. CORP provides expansion loan to Miami Based Apparel Manufacturer. IBS Investment Bank is a division of Institutional Banking Services N.A. CORP provides expansion loan to Bari Builders. IBS Investment Bank is a division of Institutional Banking Services N.A. CORP provides expansion $450,000 expansion loan to The Shredder Company. IBS Investment Bank is a division of Institutional Banking Services N.A. CORP provides $250,000 expansion loan to the Ivory Company. IBS Investment Bank is a division of Institutional Banking Services N.A. CORP provides $250K expansion loan to Piggly Wiggly . IBS, N.A. Group Presents Medical Supply Company with Unsecured Financing. Use our website to familiarize yourself with the wide range of full-service investment services we offer. Schedule an appointment to meet with a Relationship Officer using our secure contact form.